There are thousands of insects and mites that feed on urban trees. Some of these are pests that cause aesthetic damage or actual injury to trees and require management. In this guide we have outlined some common types of damage caused by insect pests and some common pests that cause each type of damage. Boring insects feed within tree trunks or branches. Some species like flat-headed borers feed between the bark and wood in vascular tissue. This often restricts the movement of water and nutrients and girdles the tree. Other species like ambrosia beetles create galleries in the heartwood. Most borers target trees that are under stress from drought, injury, flooding, poor planting, etc. Ambrosia beetles. Ambrosia beetles consist of many native and exotic species of tiny beetles. The adults bore into the heart wood of trees and introduce fungus that interferes with vascular function. As the adults bore into the tree, frass and sawdust are exuded in the shape of a bent tooth pick. Emerald ash borer. Emerald ash borer is an exotic flatheaded beetle that feeds only on ash species. Infested ash trees show branch dieback and sucker growth. Look for 'D' shaped holes on the trunk and branches. Southern pine beetle. Southern pine beetles are common pests of pines in North Carolina. Infestations can be diagnosed by thousands of tiny holes in tree trunks and pitch tubes—nodules of hardened sap—on the bark. There is no feasible curative or preventive management of this beetle in urban landscapes except to prevent tree stress and destroy infested logs. Many species of insects consume leaves. 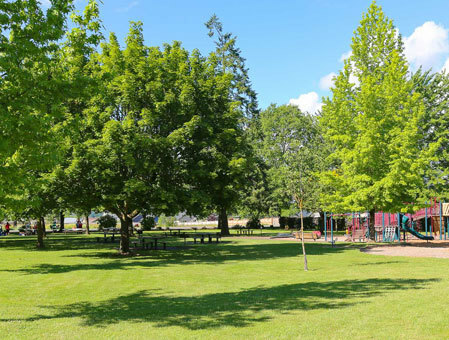 This causes trees to look ragged or to be defoliated. Many leaf chewers also produce a lot of feces that cover surfaces below the tree. 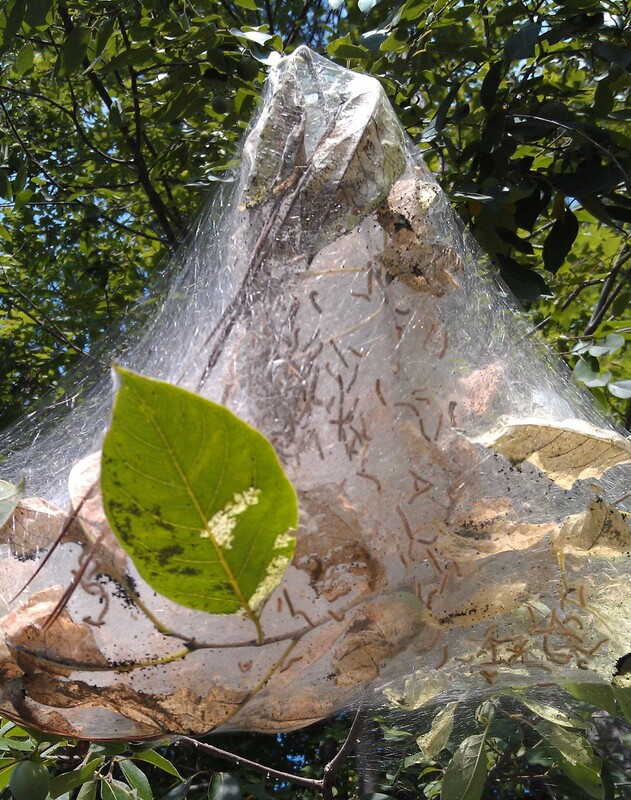 There are many caterpillars that defoliate urban trees. Caterpillars can usually be seen feeding where the damage is present. Caterpillars also produce silk. The silk is used by some species to create nests and by others to escape predators or move to new trees. Fall Cankerworms and Spring Cankerworms. Cankerworms are active in early spring for 6-8 weeks. The feed on many deciduous trees but prefer willow oaks. 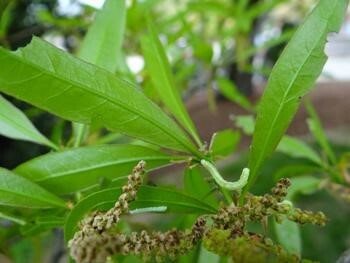 Large infestations defoliate trees and cause damage to landscape plants as cankerworms drop from trees. Eastern Tent Caterpillar. 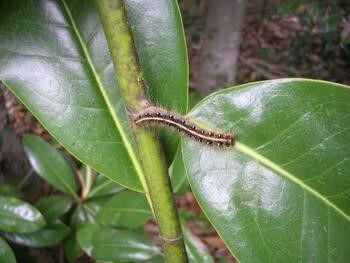 These caterpillars become active in early spring and prefer cherry, crabapple, and other Rosaceous trees. They create nests in the crotches of trees and tend to attack the same trees every year. Fall webworm. 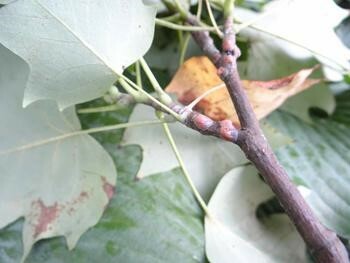 Fall webworms are active in summer and fall. They form webbed nests at the ends of branches. They are found in sourwood and many other trees species. Orange-striped oakworm. In late summer, orange-stripped oakworms can partially or fully defoliate pin oaks, willow oaks, and other oak species. They also produce a lot of frass pellets that accumulate on surfaces below infested trees. Mapleworms. Greenstriped mapleworms, Dryocampa rubicunda, feed on maple trees in summer. They are also found throughout the Eastern United States. Adults are called rosey maple moths. They are bright pink and yellow and about an inch long. They lay eggs in early summer and tiny yellow caterpillars feed gregariously. These grow into 2-inch green caterpillars with black horns. In just 30 days, they are fully grown and ready to pupate. Greenstriped mapleworm can have two to three generations per year in warm regions. 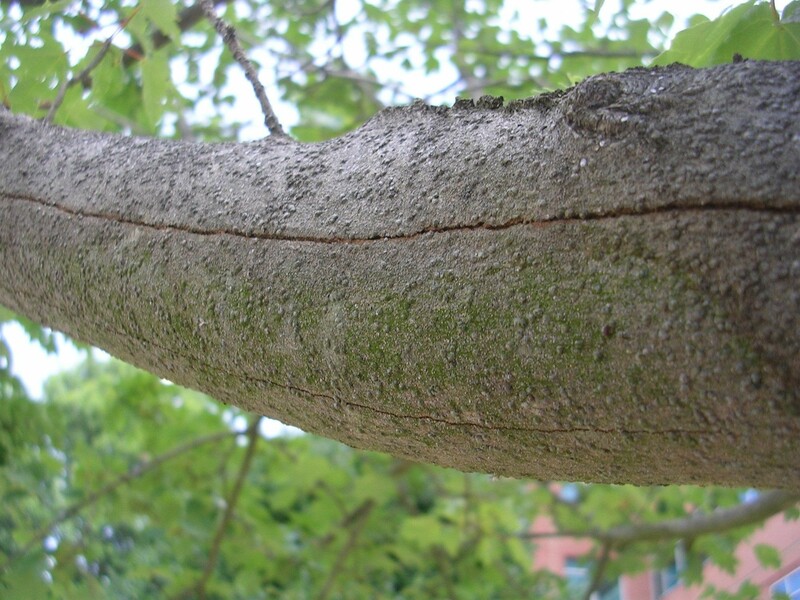 Several leaf-feeding beetles can damage urban trees as adults, larvae, or both. Some beetles consume entire leaves others leave some of the veins. These are probably the most common leaf-feeding beetles. They feed on many species including cherry, apple, crape myrtle, and linden. Leaf beetles. Many species of leaf beetles including willow leaf beetles and elm leaf beetles feed on certain urban tree species. The adults and larvae feed on leaves. This broad category includes all the insects that feed by inserting straw-like mouthparts into trees and sucking out fluid. This does not cause obvious damage the way leaf feeders do so you have to look for the insect or products of feeding like honeydew. Sometimes crape myrtle aphids become very abundant and produce enough honeydew to blacken tree trunks and surfaces below the trees with sooty mold. Generally, they exist at low density unless natural enemies are disrupted by pesticides. Tulip tree aphids. 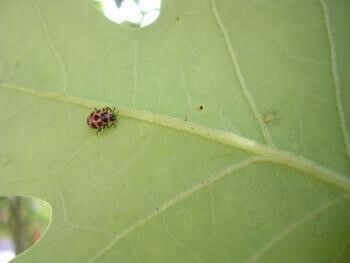 (http://ecoipm.org/2015/05/05/aphids-and-natural-enemies-on-tulip-poplar/) Tulip tree aphids become abundant in late spring but are typically controlled by natural enemies. They can produce a lot of honeydew. This is the most common pest of red maple trees in the southern US. Gloomy scales can also infest other tree species such as tulip poplar. They are gray raised bumps on trunks and branches. They are most common on trees in hot, stressful habitats. 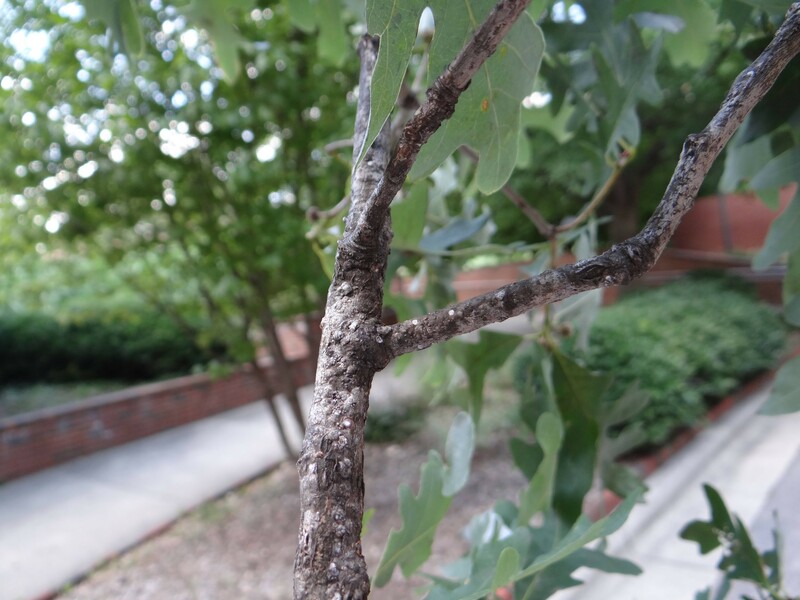 Obscure scale infests tree bark and are most common on oak trees such as pin oak, willow oak, and red oak. Obscure scales are flat and dark gray. 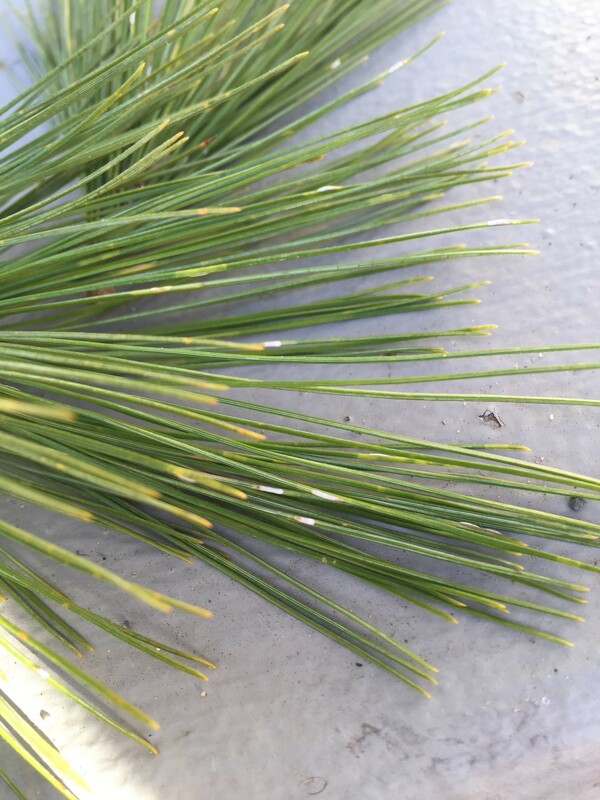 Pine needle scales are white circular scales that live on the needles of many pine species. Japanese maple scale is increasingly common on nursery and landscape plants. Japanese maple scales reproduce rapidly and are very hard to control with insecticides. They are white and gray and can cover tree trunks. These are common on willow oaks and other oak species. A similar species, European fruit lecanium, is common on red bud, dogwood, elm, and other trees. The most visible stage is the hemispherical brown ovisac (egg case) that remains on branches year round. Cottony maple leaf scale. These cottony scales are common on maples though not as problematic as gloomy scales. The ovisacs are on the leaves and look like small tufts of cotton. Primarily on tulip poplar, these are among the largest scale insects in the US. Large ovisacs are visible on branches in late summer and fall. This felt scale is new to the US but is present in most southern states. It feeds on crape myrtles. Crape myrtle bark scales produce a lot of honeydew. Tree trunks turn black from sooty mold.